We were joined by representatives from our two subsidiary companies and from many of our global regional offices. From the US subsidiary we were joined by Mats, our US operating director, who updated us on the recent changes in the US market and the current goings on with FirstNet which is rapidly expanding in the US! The devilish duo from our Australian subsidiary Steven Stephanides and Robert Seweryn also were in attendance and were as effervescent and exuberant as always! Steven certainly seemed to enjoy the wonderful cake provided by Robert Jesman's wife, as you can see by the photos below! We also were joined by many representatives from our regional sales offices over the globe! 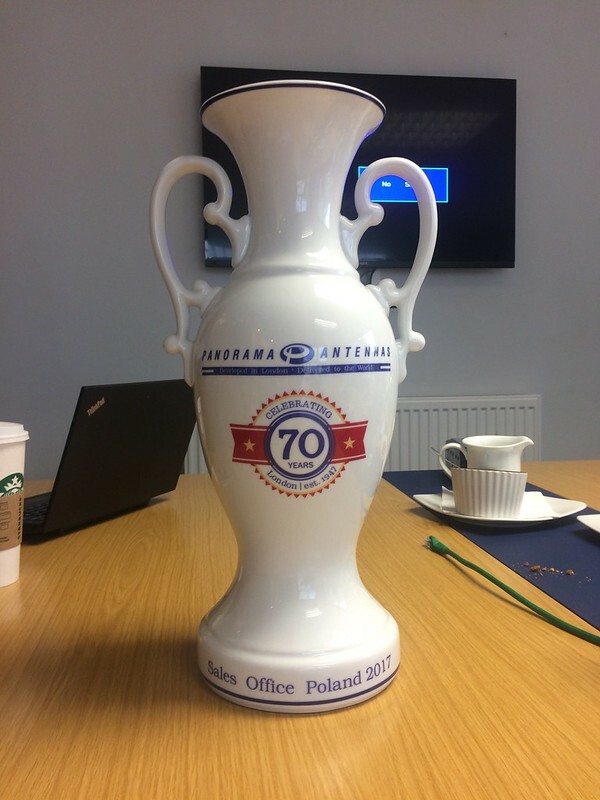 From Poland we were joined by our old friend Lech Szydlak who brought an amazing vase to celebrate our 70th anniversary which you can see in the photos below. Also joining us and taking a break from his holidaying in the UK from France we had the charming Thierry Vienney. Visiting us from the first time from Germany there was Isabell Cielinski, who enjoying seeing the parent office and meeting many of the team for the first time. And last but not least, all the way from our brand new offices in Colombia we were lucky enough to be joined by Nestor Figueroa. We had a jam packed three days with each office giving reports on their sales activities as well as an excellent presentation given by Robert Jesman on how the business is operating as a whole. There was an outline of Panorama's upcoming marketing strategies given by Jana Perlet, our head of marketing, which delighted all this in attendance and inspired many questions especially from the US office! Much fun was had both in and out of the conference room and it was lovely to round off the three days of meetings with the boat party celebrations of Panorama's 70th anniversary! It was a summer to remember and we can't wait to see how it is topped next year!